The plant is an annual, climbing shrub with long vines that can reach over 15 m in length. When the plant is young, it is almost completely covered with fuzzy hairs, but when older, it is almost completely free of hairs. The leaves are tripinnate, ovate, reverse ovate, rhombus-shaped or widely ovate. The sides of the leaves are often heavily grooved and the tips are pointy. In young M.pruriens plants, both sides of the leaves have hairs. The stems of the leaflets are two to three millimeters long. Additional adjacent leaves are present and are about 5 mm long.The flower heads take the form of axially arrayed panicles. They are 15 to 32 cm long and have two or three, or many flowers. The accompanying leaves are about 12.5 mm long, the flower stand axes are from 2.5 to 5 mm. The bell is 7.5 to 9 mm long and silky. The sepals are longer or of the same length as the shuttles. The crown is purplish or white. The flag is 1.5 mm long. The wings are 2.5 to 3.8 cm long. 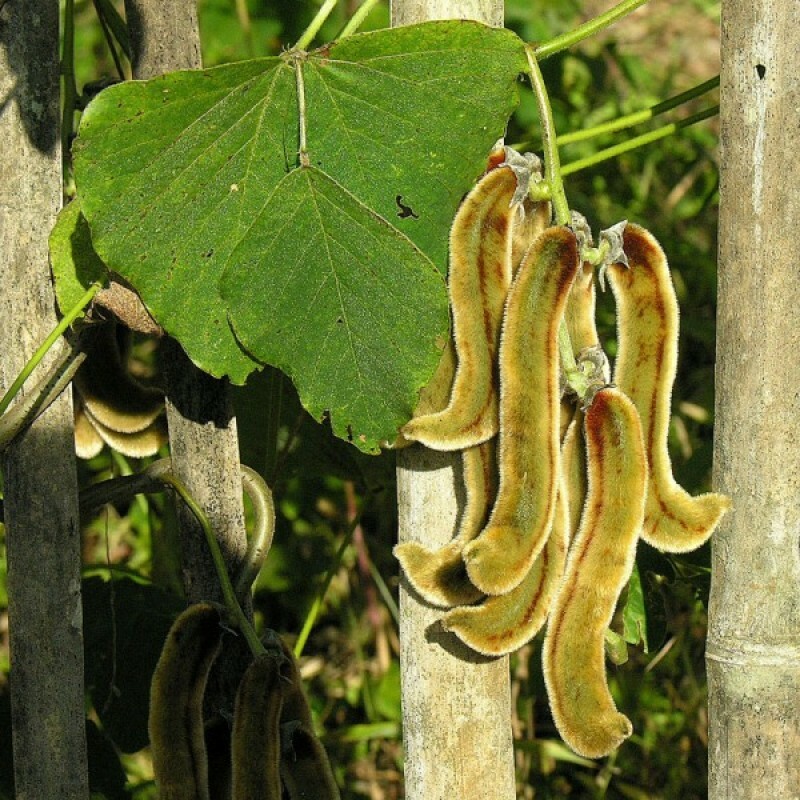 The seeds of Mucuna pruriens have been used for treating many dysfunctions in Tibb-e-Unani (Unani Medicine), the traditional system of medicine of Indo-Pakistan Subcontinent.It is also used in Ayurvedic medicine.The plant and its extracts have been long used in tribal communities as a toxin antagonist for various snakebites.